This is plate 41 from William Hodges' book 'Select Views in India'. Hodges went to Murshidabad in 1781. Named after Nawab Murshid Kuli Khan, Murshidabad became the capital of Bengal in 1705. 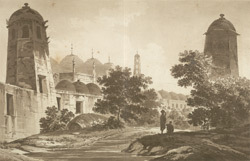 This view shows the Katra Mosque, which was built in 1724 by Murshid Kuli Khan. With its two huge octagonal minarets, it is said that this mosque was modelled after the Great Mosque at Mecca.